The lion of St. Mark, patron saint of Venice, is everywhere in the city, but while exploring Venice with kids, also look for dragons. For centuries, Venice had contact with many countries and brought back cultural and religious traditions – St. George, a most famous dragon slayer, along with St. Theodore, Archangel Michael, and St. Margherita. Scenes of the saints defeating the dragon are portrayed in mosaics, paintings, reliefs and sculpture. Some of the dragons are unusual looking, like a squishy crocodile, long-necked goose, or monster made up of head, legs, wings, and tail from different animals. St. Theodore was the first patron the saint of Venice, before St. Mark. The statue of St. Theodore stands on top of the western column in the Piazzetta San Marco. Theodore was a 4th century Roman soldier and champion of Christianity. According to legend, St. Theodore fought and vanquished a dragon, aided by the Christian cross. 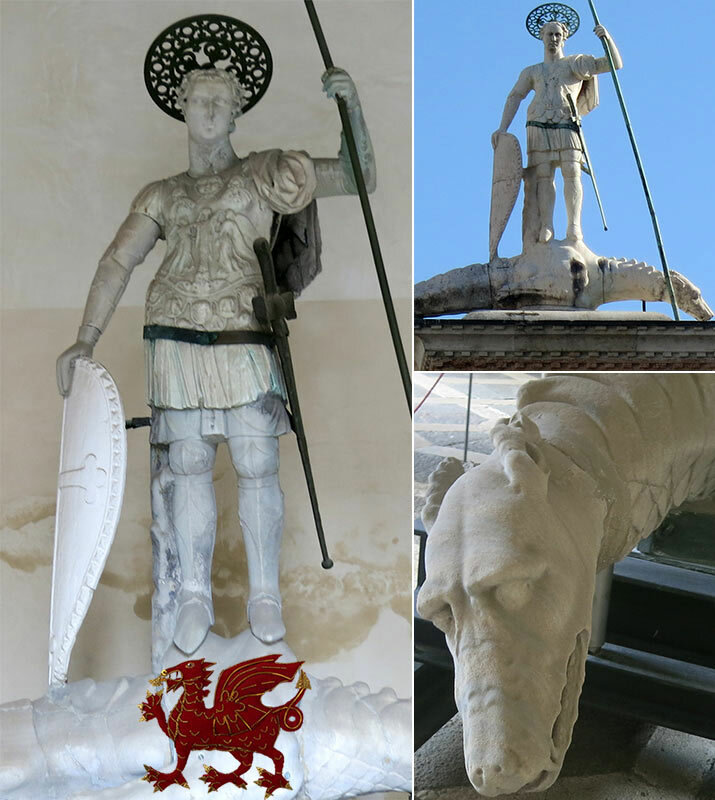 To see the original figure of Saint Theodore and dragon up close (it’s hard to see on top of the column), visit the Doge’s Palace. The statue is located in the courtyard, just behind the Giants’ Staircase. Dressed in Roman army clothing, St. Theodore holds a shield with cross in his right hand, a spear in his left hand, a hefty metal sword is strapped to his hip. He confidently stands on top of an unhappy scaly dragon, resembling a crocodile. In the church of San Salvador (Chiesa de San Salvatore) are relics of St. Theodore, brought to Venice from Byzantium in the 12th century. Another patron saint of Venice, St. George is famous throughout Europe, but the saint originally came from Asia Minor. In the Middle Ages, Crusaders brought back the legend of St. George, who slays a dragon and saves a princess. In the legend, to appease a dragon threatening the kingdom, a maiden is offered, this time it’s the king’s daughter. Just as the princess is about to be gobbled up by the dragon, Saint George rides by. St. George vanquishes the dragon, and returns in triumph. 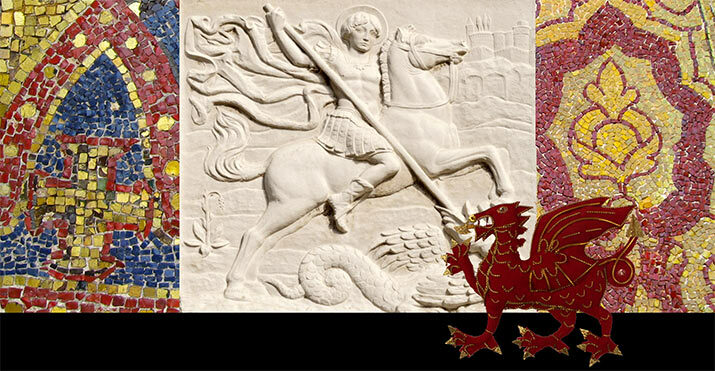 St. George was a favorite of the Schiavoni family, and throughout Venice are emblems of Saint George on houses. Look for them as you’re wandering around Venice – Campo San Zulian, Campo Bandero e Moro, in the Cannaregio, on Murano. In the Scuola San Giorgio degli Schiavoni chapel, Venetian artist Carpaccio painted scenes from the life of St. George – St. George and the Dragon ( St. George resembles a medieval knight in a tournament, spearing the dragon), The Triumph of St. George (St. George loosely holds the spiky, fuzzy dragon on a leash), and St. George Baptizing the Selenites. Be sure to go upstairs to see a shining relief of St. George in black armor, hoisting a bright red spear to fight the golden dragon! 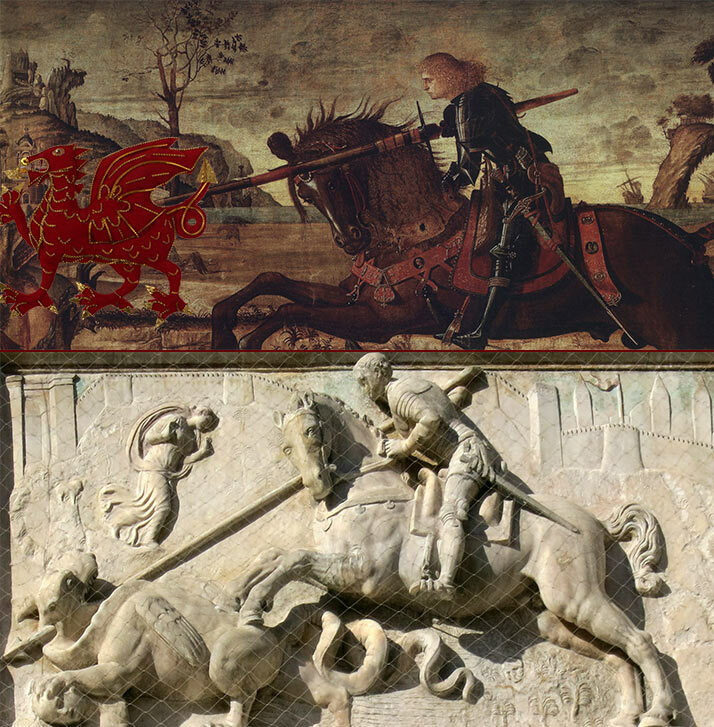 On the exterior of the Scuola are two carved reliefs of St. George battling the dragon. You’ll also find St. George in two places on the exterior west facade of St. Mark’s Basilica. At the center portal, to the left of the mosaic is an relief of St. George, holding his sword. The church of Saints Giovanni and Paolo is famous for all the doges’ tombs, but look for two glowing stained glass windows of St. George and St. Theodore (panels are next to each other). St. George doesn’t even need to look down to subdue the blue dragon under his horse, St. Theodore is wearing golden armor. While visiting the Accademia Gallery, check out a painting by Tintoretto – St. Louis, St. George and the Princess. St. George, with dark curly hair and elegant black armor, expressively waves his hands, while the princess casually rides the dragon as if she’s on a carousel! Also, by Andrea Mantegna is a painting of St. George, standing over a very tired dragon. Archangel Michael is a warrior angel, armed with a sword who kills dragons (the dragon often represents Satan). 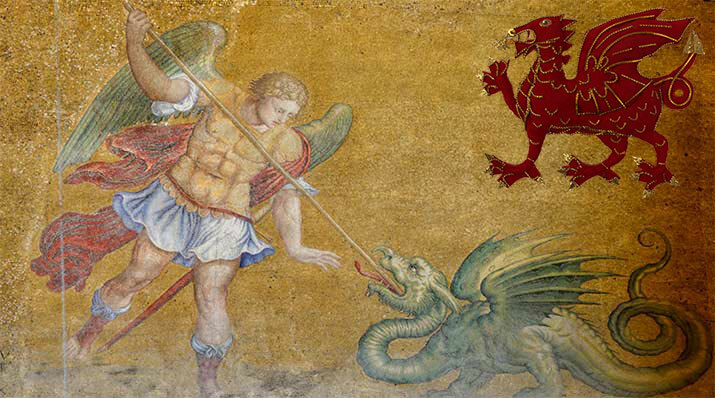 In St. Mark’s Basilica, one of our favorite mosaics is Archangel Michael and a green dragon. This mosaic is easily viewed close up from the Loggia – Museo di San Marco level. Go through the bookstore and models of the church, to the central balcony overlooking the nave below. Stand at the railing, look up at the mosaics to the right, and there’s Michael and the dragon. Archangel Michael also appears in two other locations inside St. Mark’s, but without a dragon. In the Treasury, don’t miss the dazzling 11th century Byzantine gold and enamel icon of Michael, holding a sword and orb, decorated with precious stones. On the Pala d’Oro, in the center at the top is Archangel Michael in shimmering dark blue and gold enamel, his head surrounded by a pearl halo, holding sparkling gems in his hands. Even older than St. Mark’s Basilica is 7th century church Santa Maria Assunta on the island of Torcello. Look for Archangel Michael on the Last Judgment mosaic (west wall of the church). On the bottom frieze in the center is Archangel Michael; he’s not slaying a dragon here, but opposes two blue black devils, a scale between them, weighing the souls of people. Santa Margherita (St. Margaret) has a different dragon story. She’s swallowed by a dragon (Satan is in the shape of a dragon), but uses a cross to escape, and emerges from the dragon unharmed. 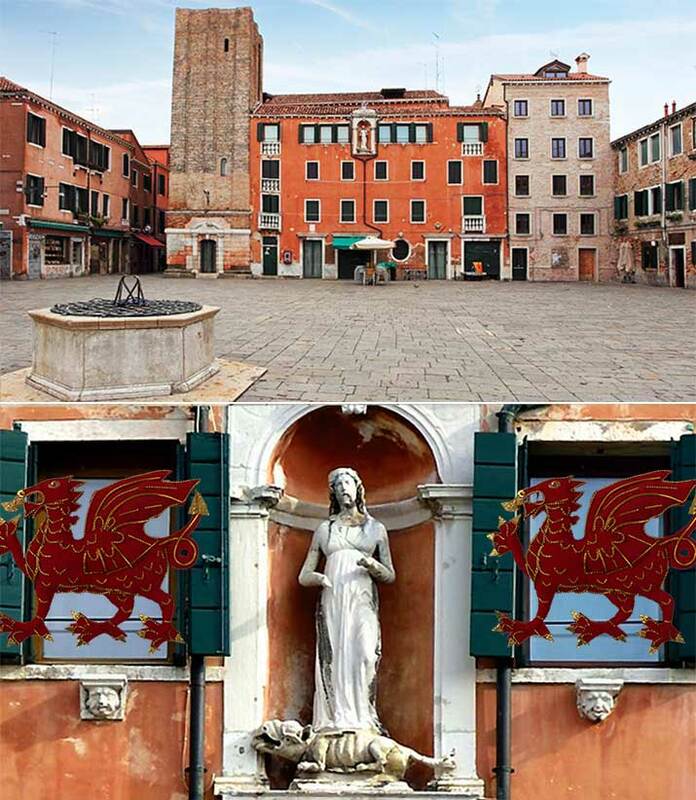 In Campo Santa Margherita, the church was dedicated to St. Margaret, and on the east side of the square is a sculpture of the saint, standing serenely on top of the daschund-like dragon under her feet. Campo Santa Margherita is one of our favorite squares in Venice. It’s big and wide open, a great place for kids to run around, and at the end of the day, join all the other families. In the campo, kids kick around soccer balls, ride around on scooters, grab a slice of pizza, parents can sit in the open air cafes and have a coffee or glass of wine. It’s a great place to relax.